Birla Open Minds Preschool Curriculum- Celebrates the importance of these formative years by providing a strong and sure start. Our mascot is charismatic and clever bird standing tall and proud ready to spread its wings and plunge into the high fight of creativity, collaboration and innovation for a strong and sure start. It signifies confidence that each child represents at Birla Open Minds International School. Our approach honours the development of the child as whole: intellectually, physically, emotionally, and socially across ages. It also recognizes that all children are intelligent and capable learners and will develop across and within these developmental areas in unique and individualized ways. The learning goals that lead the curriculum, instruction and assessment are developmental in nature and ensure a “whole child” focus. Children are exposed to dynamic learning environments, challenges and choices in activities, open ended questions, and interactions with peer and teachers. Working with colors and textures, engaging with music and movement and a plethora of other mediums with ample freedom ensure nurturance of the creativity in each child. Since children learn in different ways and learn better if learning experiences are interconnected or intergrade, our curriculum is suitable for them. It is theme based and investigate ideas from multiple perspectives. 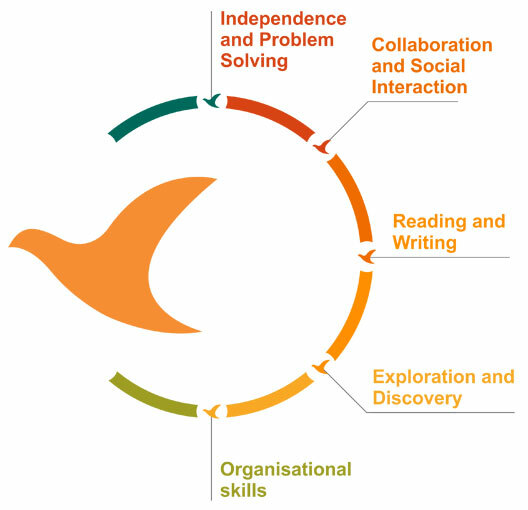 Our themes combine different areas of learning And become catalysts for developing concepts, skills and attitudes while relating this learning to real life. This learning ensures development of multiple intelligence in children. HAPPY LEARNING SPACES-We believe in providing engaging and stiulating environment for young learners. Our Learning Environment is cheerful, engaging and designed keeping in mind the needs of children. The furniture is ergonomic and sage; Classroom spaces are aesthic, uncluttered and organized; the materials and resources used are open ended while being non-toxic; learning is made amply visible through various displays and the whole environment is child compatible. The specially designed curriculum aims to maximize children’s creative potential and build their life skills to ensure that they make good choices and lead meaningful lives. The creative potential is nurtured through a wide variety of experiences and expressions encompassing the creative arts, performing arts, scientific exploration, life skills enrichment, outbound explorations and edutainment. Learning centres are resource equipped centres set up throughout the classroom where children engage in activities of their choice. The centres for block play dramatic play, language and literacy, math and manipulatives, explration, art and music have theme focused material. Play at these centers reinforces conceptual understanding as well as provides opportunities for differentiated learning. The centre of the classroom is free and has the celebrated circle. Whole group interactions during the circle time, music and movement activities and organized games build community, strong social skills and a spirit of belonging in the learners. This circle enables the teacher to maintain eye contact with every child. The verdant environs resplendent with vegetable patch, garden, trees and flowers aplenty in addition to equipment for play make a vibrant outdoor area. The outdoor are an extension of the classroom and children with their magnifying glasses and cane baskets can be found exploring, discovering and sharing the mysteries of nature. Care for self begins with building self-esteem through developing self-help skills, providing choices, autonomy, challenges, success affirmations and support to help the children know and flourish in this knowledge of being unique and special. Working collaboratively through opportunities for sharing, waiting for one’s turn, taking the role of the other and resovving conflicts helps children extend this cate to others. Caring for the environment is a habit that is inculcated early in children. This connecting thread runs through the entire curriculum and the practices followed a BOMIS.